Whitwood Footgolf is a welcoming parkland course in Wakefield, near Castleford. It’s not too far at all from the M62 so highly accessible if you’re looking for a fun day out. 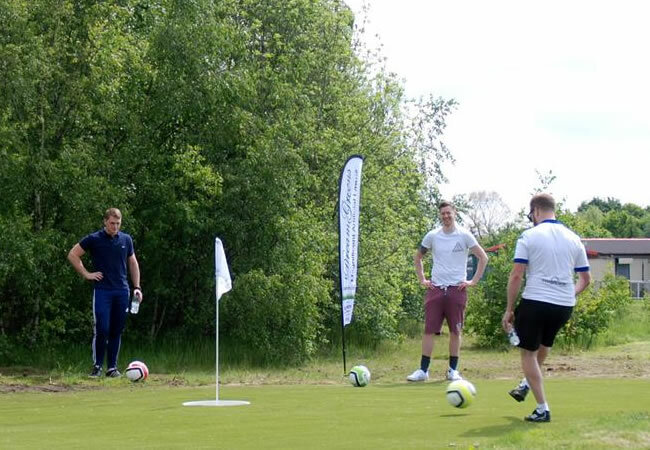 The Footgolf course is a small and enjoyable 9-hole course which is great for enjoying with family or friends. The parkland course is wonderful for Footgolf with patches of woodland, open greens, and even the odd bridge or two. Improvements have been made to the course with bunkers built to make it more difficult . They are also creating a seating area for people to watch Footgolfers play . Once you’ve finished your game, bring your family or friends in to the clubhouse where you will enjoy a warm welcome and can enjoy refreshments. Footgolf is increasing in popularity, and Whitwood Footgolf is a great place to come and give it a go. Just grab your trainers and a sense of fun and head on down to Whitwood Footgolf.